The governor says he'll focus on that effort if the people of Maine re-elect him to a second term, but he won't support the current bipartisan plan to cut the tax in half. AUGUSTA — Gov. 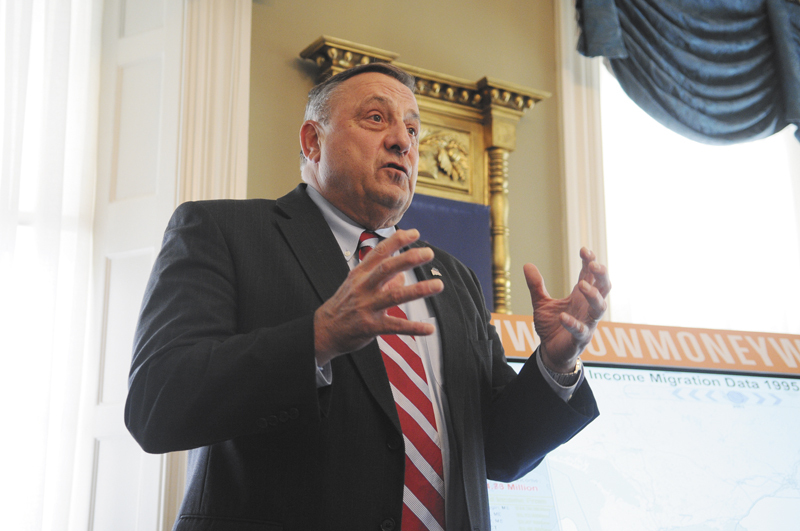 Paul LePage said Monday that his long-term goal is to eliminate Maine’s income tax, but he reiterated his opposition to a plan before the Legislature that would cut the income tax rate in half while raising and lowering other taxes. LePage made the statements at a press event at the Blaine House that featured an author who said Maine has been losing wealth and population to states with no personal income tax. 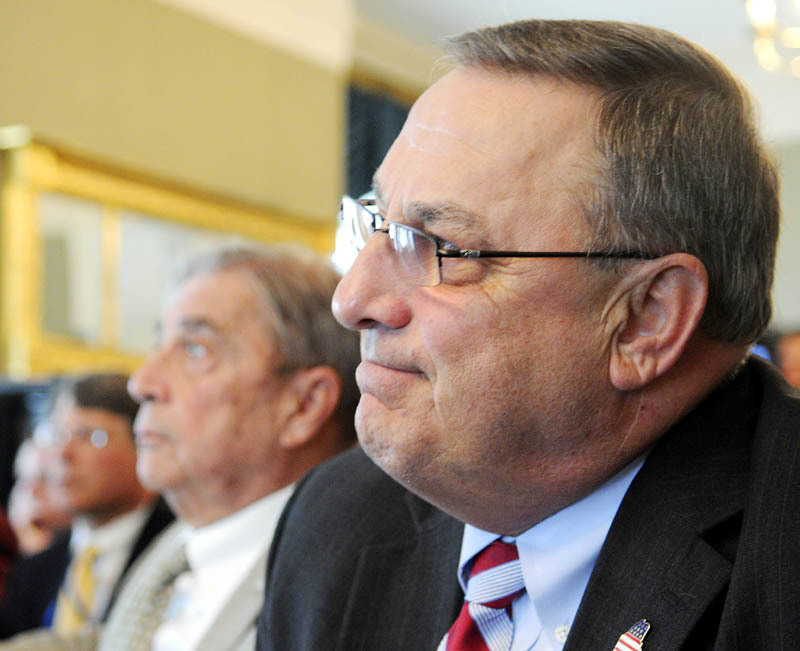 “My goal is … if I’m re-elected to a second term, at the end of that second term we would have no income tax in the state of Maine,” said LePage. LePage said he remains opposed to the tax-reform plan from the Legislature’s so-called Gang of 11, a bipartisan group of legislators led by independent Sen. Richard Woodbury of Yarmouth, a Harvard-trained economist. The group says its goal is to shift much of Maine’s tax burden to out-of-staters while equalizing the state’s reliance on property, sales and income taxes. Its proponents say it would reduce the tax burden on nearly every Maine resident. The plan, L.D. 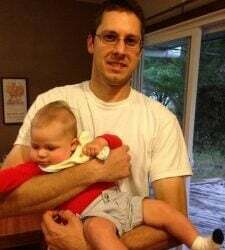 1496, would cut the income tax rate to a flat 4 percent, increase the state homestead exemption from $10,000 to $50,000 and eliminate the estate tax. Those cuts would be paid for by raising the sales tax by a percentage point and broadening the tax base by eliminating exemptions on most products and services. The plan has run into opposition from the left and right. Republicans, like LePage, have derided it because it would raise an additional $160 million a year in tax revenue. The speaker at the Blaine House on Monday was Travis Brown, who wrote “How Money Walks,” a book that tracks the movement of income from state to state. Brown recommends a “pro-growth” tax policy that doesn’t tax income. 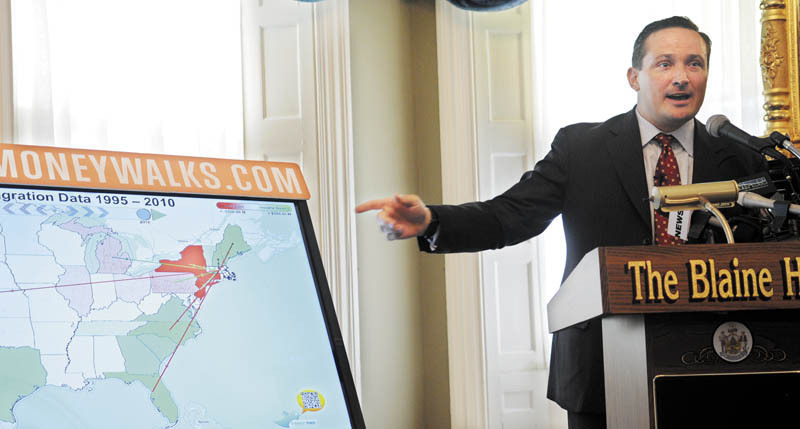 He said Maine’s income tax is likely impeding the state’s growth. According to data collected by Brown, Maine gained $1.62 billion in annual adjusted gross income from the in-migration of about 6,000 people from other states from 1995 to 2010. Maine gained more than $806 million from in-migration from Massachusetts. But Maine lost nearly $790 million to three states without personal income taxes: Florida, Nevada and Tennessee. Florida accounted for more than $721 million of the loss, as 8,800 Maine residents moved there. While lowering Maine’s income tax would likely help it perform better, Brown said, the state has many natural advantages that help it to attract or retain residents. Rep. Gary Knight of Livermore Falls, the Republican sponsor of the tax-reform proposal, said he would like to eliminate Maine’s income tax, just as LePage would. Knight said that would be virtually impossible without raising other taxes, as the plan would. “You can’t just pull manna from the heavens,” he said.